Aoi Hana, or Sweet Blue Flowers, is an example of a well-defined manga. It’s not open ended since the manga finished in July of 2013, but as there are certainly enough other ongoing manga series for fans to keep up with, it’s quite refreshing to take a break and read a completed manga. There are eight volumes, but as I read, they seemed to fly by. There is also an anime available with the same name, for all you who would perhaps prefer to watch rather than read Aoi Hana. Aoi Hana follows our hero Manjoume Fumi through high school. Fumi is an interesting protagonist, as are most of the characters in Aoi Hana. Fumi is tall, with glasses and long dark hair. If you’re a yuri fan, you might think to yourself, “Ah, so she’s that type.” But Fumi isn’t stereotypically tsundere or tough, or spectacularly smart or bookish, and not particularly obsessed with sports. She’s just your normal girl. Fumi’s strongest trait is her passion and love, which is entirely unexpected because it doesn’t really suit her looks. Ah-chan, on the other hand, looks like your typical high school girl character being rather short and cute. While she has a happy-go-lucky personality, she’s always there as a solid rock in Fumi’s life. As you venture further into the plot, you will end up loving her because she exhibits admirable characteristics like being dependable, forgiving and caring. There are a few more characters worth noting in this summary, because they’re so well-developed – Sugimoto Yasuko is the dazzling upper year. She garners much attention as Matsuoka’s (Fumi’s school) basketball team captain and also with her performance at Fujigaya (Ah-chan’s school) as Heathcliff in a stage performance of Wuthering Heights. It’s probably worth noting that both are all-girls schools, and most of the characters don’t bat an eye at the shoujo-ai (girl-girl love) that plays a central focus in the story. More on that later. I’m used to manga and anime like Sailor Moon, Naruto and Bleach to name a few where characters perfectly fulfill their stereotypes. Even Sasameki Koto, another yuri series, has characters that are more strongly bound to stereotypes. The characters of Aoi Hana are distinct from those stereotypical characters – there’s more to them than the first traits that come to mind from looking at them. 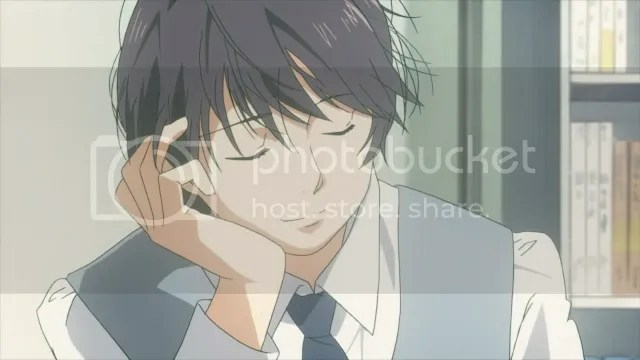 Sugimoto is the basketball team’s captain, but also enjoys drama, and spends quite a bit of time in the school library. Fumi has glasses and long hair and is tall, but she isn’t a nerd. She actively pursues romance over studying. As a result, the characters from Aoi Hana are more memorable than those with similar looks that possess token traits like wearing glasses that usually implies that the character is studious. Fairly early on, you realize that the cast of Aoi Hana isn’t that large. However, that doesn’t detract from the complex relationships showcased in this manga. The main relationship in Aoi Hana is that of Fumi and her best friend Ah-chan. I could wonder about the point of Aoi Hana for hours, but my latest theory is that the story goes to show that you love the people who have stood by your side the most. Ah-chan always took care of Fumi when they were younger, and she takes care of Fumi even in high school. The characters are all innocent. No one is inherently evil, but they all manage to make each other sad while seeking happiness. And when they’re sad, you as the reader are sad. Aoi Hana is notable because all the characters are relatable. There are so few manga where the beautiful character is rejected. After all, that just doesn’t make sense! But in the real world, it’s not just about who’s the prettiest. It’s about who you’d rather spend your time with, and Aoi Hana reflects this honestly. If you’re the type of person who is open to reading stuff of this genre, and don’t mind the infrequent break from the ultra-violence of things like Bleach or Naruto, then why not check it out? Aoi Hana is a light read that never fails to set my heart aflutter. Some of its aspects upon re-reading may seem over the top, but really it’s like they’re a simple joke homage to the genre. Enough stereotypes are turned on their heads to let you know that this isn’t any old run-of-the-mill romance/drama shoujo-ai manga. Every time I think of yuri, I think of Aoi Hana and how the characters are totally flawed and it makes them seem like bad people, but as you read you know that they aren’t bad, just human. Oh yeah, before I finish, I’ll get to the points that I really wanted to make. First off – back to what I said I’d discuss later. Later is now. At these all-girl schools, no one is surprised when girls say they’re in love with girls, or dating another girl. There’s no stigma about being gay or lesbian. There’s some worry about it not being normal, or being embarrassed to tell people, but there’s no emotional uncertainty in the characters. Fumi never wonders, “I like girls? What? I never thought I would be interested in a girl, this is so weird,” and when she tells Ah-chan that she’s going out with Yasuko, Ah-chan isn’t weirded out or scared. She embodies an acceptance and open-mindedness that makes this manga quite progressive. In this respect, Aoi Hana is perfect. Characters understand themselves and there’s never that source of drama, and rather, the complexities of relationships are what make the story so moving. The other point I wanted to make about why Aoi Hana is special, as a manga (or anime), not just as a yuri or shoujo-ai. The story isn’t too long, which is nice. But more importantly, the manga is a window into the characters’ lives. When you read any comic, the panels are literally windows. Aoi Hana takes this another step further by having events that happen outside of these windows, implying to the reader that there’s more to the characters’ lives than just what you see through the windows. Sometimes events are recapped by Fumi as she lies in bed that night, and you think “Hey! That wasn’t shown!” but the thing is, Fumi and Ah-chan live beyond those windows, too. And that’s mastery of the art form, in my opinion. The use of that technique makes my mind blown by all its depth. At first it’s jarring to lack the full picture of the story, but it’s what keeps me coming back. Whenever I re-read any part of Aoi Hana, I notice things I hadn’t before, and I understand the characters even better. That’s what truly makes Aoi Hana a great manga. So, regardless of whether you like shoujo-ai or not, Aoi Hana is a nice read that doesn’t take too long, unlike many other manga out there. A really really good review on a manga that I’m probably going to end up buying, that or watch the anime. Or maybe both! Anyway, I hope you enjoy this article! A very well written piece. I watched the anime and was bored to tears by it. I kept waiting for the bespectacled girl to to hook up with the tiny lass, but nothing much happened. Perhaps the manga is better as it is a complete story, or maybe I am just not the target audience for this sort of thing. One of the things that made come back to Aoi Hana after reading it was that I thought they didn’t get together at the end, and I didn’t understand what happened. But after reading it again, I decided otherwise. A lot of the slight details in Aoi Hana are “unseen,” which when I think about it, is really tao-ish – http://www.bookmice.net/darkchilde/spirit/tao11.html Also, I think I appreciate it the most when I’m in a really artsy mood.